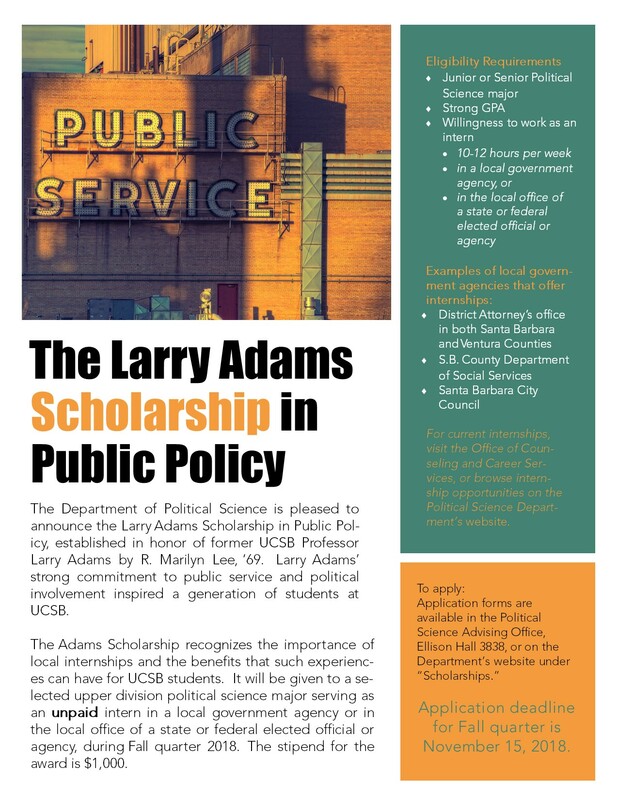 The Department of Political Science is pleased to announce the Larry Adams Scholarship in Public Policy, established in honor of former UCSB Professor Larry Adams by R. Marilyn Lee, ‘69. Larry Adams’ strong commitment to public service and political involvement inspired a generation of students at UCSB. The Adams Scholarship recognizes the importance of local internships and the benefits that such experiences can have for UCSB students. It will be given to a selected upper division political science major serving as an unpaid intern in a local government agency or in the local office of a state or federal elected official or agency, during Fall quarter 2018. The stipend for the award is $1,000. For current internships, visit the Office of Counseling and Career Services, or browse internship opportunities on the Political Science Department’s website. Application deadline for Fall quarter is November 15, 2018.